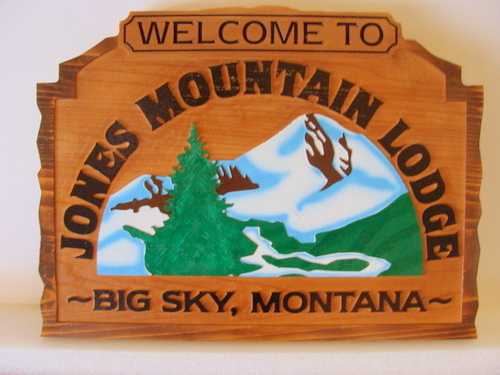 Above is shown a carved Redwood wooden sign for the "Jones Mountain Lodge". The attractive natural-looking lodge sign above features raised text , a carved 2.5-D multilevel mountain scene with ski runs (in brown) and Fir tree trees. This attractive sign and similar ones can be made of stained, natural, and/or painted wood , or painted HDU. The sign is hand-painted , and the wood background is left its natural color (light stain) and then clear-coated twice, This sign can be easily mounted on an outside wall, or hung from the ceiling or an iron hanger, or placed between two posts. We can make sandblasted or carved 2.5-D, 3-D, or engraved (V-carved or flat bottom) signs for a hotel , B&B or inn, with any custom design, in any size from 2 ft to 16 ft wide. These can be placed on an inside or outside wall, on a stucco, stone or brick monument base or pedestal, between iron or wood posts,or hanging from an overhead scroll bar or other ironwork or wood beam. We can customize these signs with any shape, border, font style, art, or color scheme with engraved or raised text and art of your choice . To see over 125 other signs for hotels, motels, resorts, B&B's, and inns, please click on "Return to List" below right. To see premium 3-D or 2.5-D carved, sandblasted, or engraved, High-Density-Urethane (HDU) or wood signs and EPS dimensional monument signs for hotel, motels, inns, and B&B's in Gallery 29, , please click o,n "Return to List" below right.